A White House source has leaked nearly every day of President Trump's private schedule for the past 3 months to Axios' Alexi McCammond. 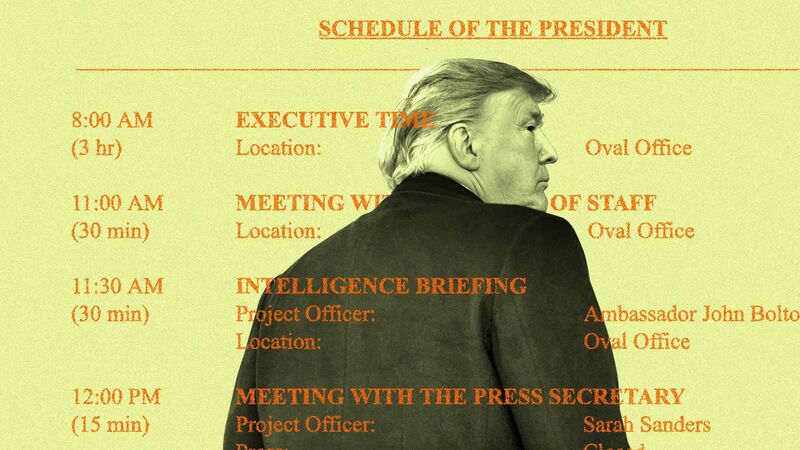 Why it matters: This unusually voluminous leak gives us unprecedented visibility into how this president spends his days. We've published every page of the leaked schedules in the story that accompanies this item. To protect our source, we retyped the schedules in the same format that West Wing staff receives them. The schedules, which cover nearly every working day since the midterms, show that Trump has spent around 60% of his scheduled time over the past 3 months in unstructured "Executive Time." But Trump, who often wakes before 6 a.m., is never in the Oval during those hours, according to 6 sources with direct knowledge. The longer view: Chris Whipple, a student of presidential schedules who wrote the book 'The Gatekeepers: How the White House Chiefs of Staff Define Every Presidency," told us that "there's almost no [historical] parallel" for how this president spends his days. President Donald Trump’s time management — or lack thereof — is without recent historical precedent. To put our new reporting on his schedules in context, we spoke with former top aides to presidents Barack Obama, George W. Bush and Bill Clinton. The difference between Trump and his recent predecessors is eye-popping. Trump’s fancy-free scheduling approach is no mistake. In "The Art of the Deal," he explained that he thought too much planning curbed his creativity and impeded his thinking. That philosophy is alive and well in the White House, according to more than half a dozen current and former officials. Thousands of rival protesters hit the streets of Venezuela's capital, Caracas, yesterday — many pushing for the replacement of Nicolás Maduro with self-proclaimed interim successor Juan Guaidó, and others rallying behind Maduro, the BBC reports. Why it matters: International pressure has been mounting on Maduro since President Trump and other world leaders said they considered Maduro illegitimate due to rampant election fraud and that they recognized Guaidó as Venezuela's leader, in line with the Venezuelan constitution. "The rival protests come a day ahead of a deadline given to Mr Maduro by major European countries to announce new presidential elections — otherwise they would also recognise Mr Guaidó," the BBC reports. What's next? "Military support is seen as crucial to Mr Maduro's hold on power." "Many supporters at Saturday's rally were seen wearing the khaki uniforms of the government militia." National security adviser John Bolton is publicly urging others in the Venezuelan military to defect from Maduro. Bolton tweeted yesterday: "Another Venezuelan military officer recognizes the legitimate President of VZ. The US calls on all military members to follow General Yánez’s lead, and to protect the peaceful protestors supporting democracy." The House will vote this week on the Veterans' Access to Child Care Act, according to a Democratic House leadership aide. This bill is a priority for Speaker Nancy Pelosi and Julia Brownley (D-Calif.), the newly elected chair of the House Veterans' Affairs Health Subcommittee. The bill makes permanent a pilot program that requires Veterans Affairs to pay for child care, or provide it onsite, while a veteran goes to doctor appointments. Committee hearings to watch include Thursday's Ways and Means hearing on presidential tax returns and three Energy and Commerce hearings — climate change on Wednesday, Texas ACA case/pre-existing conditions on Wednesday, and family separation on Thursday — according to another Democratic leadership aide. The Senate will vote on Monday "to adopt the bipartisan McConnell amendment to S1 (the Strengthening America’s Security in the Middle East Act) and then move to final passage of S1 before the end of the week," according to a Senate GOP leadership aide. Trump's nominee for Attorney General, Bill Barr, is expected to come out of committee on Thursday, according to the leadership aide. And last week Republican leader Mitch McConnell took a procedural vote to advance on the "Bipartisan Lands Package." (Summary of the legislation here). The Senate could move to this as early as this week, according to the leadership aide. Tomorrow: Trump has lunch with Vice President Mike Pence. Tuesday: Trump delivers the State of the Union address. Wednesday: Trump has dinner with faith leaders. Thursday: Trump delivers remarks at the 2019 National Prayer Breakfast and has lunch with Secretary of State Mike Pompeo. Friday: The president has no public events scheduled. The former Federal Reserve governor arrived at the White House with a set of sharp points to make to Trump about monetary policy, according to a friend of his. But that's not quite how the conversation went. "You're a really handsome guy, aren't you?" Trump said, per the friend. "How old are you?" Sen. David Perdue has gotten the same treatment, per a source with direct knowledge. "You're a really good looking man, you look the part," Trump told the Georgia Republican at one meeting. "Those other guys [senators] don't know to dress," the president added. "Those bozos — it must be embarrassing to stand next to them on TV." During a Montana MAGA rally in October, Trump launched into a diatribe about the failed nomination of Ronny Jackson to head Veterans Affairs. Praising his former White House physician, he told the crowd what "a handsome, wonderful father" Jackson was. At the White House celebration for the Clemson Tigers' National Championship win, Trump told the room: "Wow! Wow, what a group. Look at that quarterback. Oh, I want to be the agent of that tall, handsome quarterback. Six-foot-seven." At a fundraising event last March, Trump bragged about making up information in a meeting with Canadian Prime Minister Justin Trudeau. "Nice guy, good-looking guy, comes in — 'Donald, we have no trade deficit.'" It's come to my attention that some Sneak Peek readers will be watching the Super Bowl tonight. It's also come to my attention that some Sneak Peek readers are unaware of a way better sport: Rugby League. In Australia, my homeland, we have a thing called "State of Origin," a glorious annual series that pits the best Rugby League players from New South Wales against the best players from Queensland. I think after watching some State of Origins you'll agree it's way better than "American football." Here's a video that will help you understand why this is a correct opinion.